Last weekend my family and I visited Sea World San Diego to ride the new Manta Flying Roller Coaster. We have visited the park many times both in San Diego and in Orlando but this time we came to see the new SeaWorld Manta Flying Coaster attraction. And we were very glad we did! 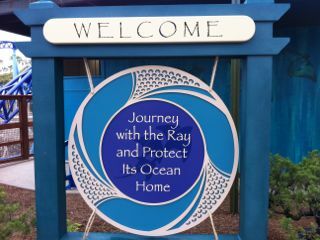 Check out the video here to see highlights of our visit including footage of the new SeaWorld San Diego Manta Flying Coaster! One of the first things that I noticed was that Manta was not as high as I thought it would be. For me that was a good thing! The taller the roller coaster the less likely I am going to be an enthusiast. Apparently the design was restricted in height because construction on the California coast has to be under 30 feet high. Building new attractions in this area is not an simple design task! 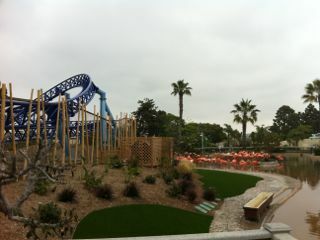 Whilst the Manta coaster isn’t high it most certainly covers a huge area. We were all surprised by just how long the Manta roller coaster is. It covers a lot of ground and the ride lasts 2 minutes 35 seconds. This is a very satisfying attraction for both the roller coaster enthusiast (my husband and teenage daughter) and for those of us rather more selective in our coaster experiences (namely me). 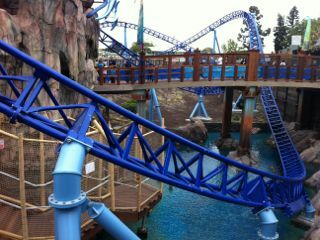 Manta has the thrills, but it has just the right level of adrenaline versus downright scary for me! The SeaWorld San Diego Manta experience has a broad appeal. This is not a scary roller coaster – it is a thrilling experience which will appeal to some who just really don’t enjoy traditional coasters. Me included! Our family spend a lot of time in theme parks. So we spend a lot of time in lines. And we are very picky about the ride line experience! It is good to report that the line for Manta was much shorter than we had anticipated. We arrived at opening time and rode the attraction 4 times without really even encountering a line. And this was a Sunday morning. If we had arrived much later this would probably have been a very different thing. The line moved quickly and we were soon into the ride loading area having passed through the underwater aquarium Manta viewing areas. Yes you get to see the real creatures before you experience the ride. You can also access viewing areas if you don’t want to go on the ride (or are not tall enough like my 6 year old). The loading area has an Asian inspired theme and the SeaWorld crew were very helpful and skilled in loading guests onto the ride quickly and efficiently. The Manta starts in a dark show building as the anticipation builds! There is a very cool effect where you hear the sound of bubbles and then with the magic of a 270 degree projection screen you seem to be surrounded by mantas. Your ride vehicle then moves from side to side so that you are meant to feel as though you are swimming with the rays. Then the excitement begins. The Manta has a very smooth catapult launching system that accelerates from 0 to 43 MPH in just 2 seconds. I most definitely prefer roller coasters with quick acceleration systems like this (for instance Rock ‘N’ Roller Coaster in Disney World) as you get the thrill without the fear of slowly climbing up a incline as you do on many coasters. The ride was amazing. It goes through a series of steep twists and turns but everything is very smooth and very quiet. It feels a lot faster than it actually is and that just adds to the overall experience. Manta got a very definite seal of approval from all of the family. And very definite disappointment from my 6 year old who was not tall enough to ride! As with all popular attractions get there early! You could be in for a long wait if you arrive at lunch time but get there when the park opens and you may walk straight onto the ride with little or no wait. Make sure that you set the expectations for your children. There is a height minimum of 48 inches so if your child is not this tall then prepare them ahead of time to let them know they will not be able to ride. Guests between 42 inches and 48 inches tall must be accompanied by someone who is at least 14 years old. Should you ride on the front or the back of the Manta coaster? It really depends on what you want from your thrill rides! The front is good and certainly gets you a great view. But most thrill ride junkies will want to go at the back for the extra air time. At busy times you may want to think about purchasing a SeaWorld San Diego Quick Queue Premier Pass which will get you into the express line on one time only for Manta (and unlimited front of line to Journey to Atlantis, Wild Arctic and Shipwreck Rapids). These are $34.95 per guest in addition to park admission. Through 12/31/12 members of the military (which include active duty military, active reservists, National Guard, Coast Guard) and as many as three direct dependents may enter a SeaWorld park free of charge. You must register in advance at www.herosalute.com and complete a form. You then take the form and a valid ID to the park to claim your free day ticket. SeaWorld San Diego also has an All Day Dining Deal at a rate of $29.99 for adults and $14.99 for children. The participating restaurants are Shipwreck Reef Cafe, Mama Stella’s Pizza Kitchen, Calypso Bay Smokehouse and Seaport Market. This would be a good deal if you are going to eat lunch and dinner at the park or if you want one meal and some snacks. 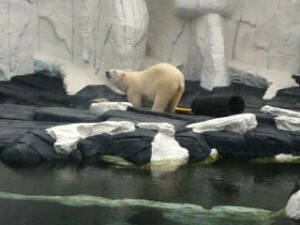 SeaWorld provided us with tickets to visit the park for the day. Our opinions, as always, remain our own.